Hello Jaber A., we appreciate you taking the time to leave us this feedback and expressing your thoughts on our late fees. Because we understand that it can be difficult to get the full rental amount together on the 1st, we offer options to pay anytime throughout the month prior to the day it's due! If you would like more details on how to go about this option, contact us at (509) 363-1090. We hope to see you soon! Hello Jonae B., we appreciate you taking the time to leave us this feedback. Feel free to reach out to us if you need anything. Have a wonderful day. Good apartments but management is kind of all over the place. I’ve been trying to add two people to an upcoming lease but it’s been two months and the office still can’t figure it out. Hi Emily, Thank you again for taking the time to let us know how we did. We truly apologize for an inconvenience this may have caused by adding people to your upcoming lease and are glad to hear that everything has been taken care of properly. If there is any outstanding issues, please let us know. Thank you so much again for your feedback. We hope you have a great day! Hi Anita M T., we are very happy to have provided you with such a positive experience! If you have any further questions, please give us a call. We're always happy to help! We recently in and so far our experience has been amazing. Very helpful and understanding staff; and a beautiful apartment. Thank you all so much. Hi James! Thank you for your very kind words regarding our staff an we appreciate your positive review about your recent experience at Eagle Point. We always strive for 100% satisfactions and I'm glad we can meet those expectations! Please let us know if there is anything else we can do for you in the future. I really Love it here at Eagle Point the Apartments are so nice and have so much space. It's really quite for the most part and all the people are cool. Lynn W., thank you for your kind words and this wonderful review! We always strive to provide top quality service to every guest, and are pleased to hear that you enjoyed your experience here at Eagle Point! It’s been wonderful so far! When we moved in we were able to request a kitchen with tile in it and we were able to get into one with just that! Hi Lyndi P.! We're so happy we were able to help you out! Our team strives to deliver an excellent experience, and are glad you found this to be the case during your visit. If you have further needs or questions, please reach out! Love my warm welcoming home. Its close to campus and is a friendly environment, just wish the parking lot was better maintained in winter. Other than that is a great place to live. Thank you again for taking the time to let us know how we did. We are working on snow removal as quickly as possible but if there is an area that needs more attention than others, please let us know. If you ever need anything else from us, please feel free to give us a call or stop by. Have an awesome day! The gym equipment could be a better quality brand. Other than that, they are nice apartments and it is nice to live here, The town of Cheney, needs a movie theater and a Winco. We appreciate your positive review about your recent experience with us and we will pass along your comments about the gym to our management! As for the town of Cheney, we agree! Thank you again for your review. Picked these apartments at random while still living in Atlanta, GA. Not disappointed! Quiet community, thick walls, wonderful neighbors in a gorgeous area. Selah T., we strive for 100% satisfaction, and it is great to see you had such a positive experience at Eagle Point. We're glad to hear we delivered such a great experience. If there's anything further we can do for you, we are happy to help! I love living at Eagle Point, the apartments have a perfect amount of space and the appliances work great. The washer and dryer are so great compared to friends that I have talked to living in Cheney. The management has worked on clearing the snow, I wish they did better. Some mornings this winter it has been a sheet of ice walking to my car. Jordan J., thank you for your kind words and this wonderful review! We are working on snow removal as quickly as possible but if there is an area that needs more attention than others, please let us know. If you ever need anything else from us, please feel free to give us a call or stop by. Have an awesome day! Hi Yaneli P., thank you so much for your positive comments about Eagle Point! Making lasting friendships is just one of the many bonuses here and we are so glad to hear that you have experienced this! If you ever need anything else from us, please feel free to give us a call or stop by. Have an awesome day! I really enjoy it here there hasn’t been one complaint that I’ve had. EP has everything kept high quality! Especially well with the snow and having them clear off all the roads. They are also very good at helping with any question I have. They have very good customer service, each employee is very nice that I have met! Thank you again for taking the time to let us know how we did. Our maintenance team works hard when snow falls and we are glad to hear we are exceeding those expectations! We hope you have a great day! Love how well taken care of the apartments were this winter! Thank you so much maintenance and all the other helping staff at the office!!! Hi Haylee M.! We're so happy we were able to help you out! We always strive to provide top quality service to every resident, and are pleased to hear that you enjoyed your experience here at Eagle Point! This community is very safe and supportive. This would be a good place to have a family. I love the constant support and assistance from the office. There are tons of ammenties and it’s all around a great place to live! Savannah B., thank you for your kind review; we are happy to pass along your comments to the team here at Eagle Point! We hope to see you soon! So far we are enjoying our experience at eagle point apartments. The staff has been helpful. Love the free kombucha. Wife loves the tanning. Hi Dakota A., we are very happy to have provided you with such a positive experience! If you ever need anything else from us, please feel free to give us a call or stop by. Have an awesome day! Absolutely awesome! The kids love using the workout room and the theater. The rent is a bit high but with everything offered its okay. I love the friendly staff too. No issues. Eagle point is nice. There’s a pool which is great for the summer and a movie theater room at the office. Additionally, I like the numerous events that are held here. Mary B., your wonderful feedback and rating mean a lot to us. Thank you, and have a fantastic day! After only being here 11 days, we love it. I was worried about moving to a college town with a 6 month old, but Eagle Point is very quiet and enjoyable. Katherine A., thanks for your praise and kind comments about our team. We look forward to your next visit! Take care! I've heard mixed reviews but I haven't had any problem with Eagle Point so far. Communication with them has been a breeze whenever I have any questions or concerns about anything. Hi Katherine A., thank you so much for your positive comments about Eagle Point! Your recommendation means so much to us and we're so happy to have earned it. Thank you again for taking the time to let the world know about your positive experience. Have a great day! Overall a really great community. Maintenance is outstanding, if you ever run into any issues within your apartment. I have yet to have a problem that hasn’t been solved. Hi Sydney B.! We're so happy we were able to help you out! Feel free to reach out to us if you need anything. Have a wonderful day. I really love my apartment! However, it would be awesome if you guys could use deicer in the parking lot because it is an ice rink, Also i had a really negative experience with management when I moved in. Thank you again for taking the time to let us know how we did. We don't currently use deicer in our parking lots because it can crack the concrete and create potholes, however we do use gravel to create traction. If there is an area that needs more attention, we would be happy to go over it again! We would also love to get more information about your move-in experience and see how we can change your experience going forward. Please reach out to us at (509) 363-1090 at your earliest convenience. We hope you have a great day! Maryssa M., thank you so much for the high star rating and your feedback. We are always open to suggestions and will pass them up to our management to see what options we have in the future. Thanks for taking the time to leave a review. 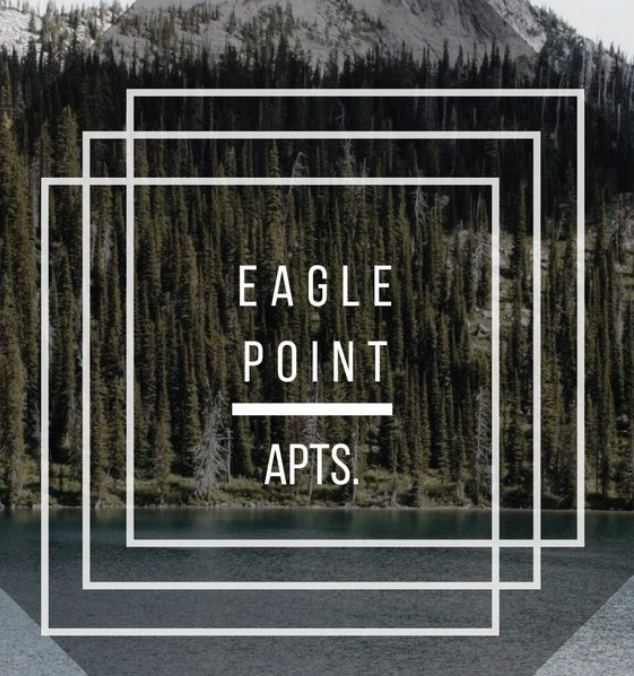 Eagle Point has been a great home away from home while at college. It is in a great location close to campus, and the complex is so nice and provides great services. I’ve had a great experience here the last couple years!